And I’m beginning to feel my age. I’ve realised that, as soon as I hit the benchmark in July I’ll be too old to become a professional in any sport – even darts – and that depressed me a little bit. So I needed cheering up somehow. I am aware that 50 is a big deal for many people and I have decided to be one of them. So how could I mark my passage into early middle age (I know, I’m kidding myself, but that’s what I do)? People who know me reasonably well are aware that, outside of my family, I have 3 great loves: Liverpool FC, chronographs and playing music. I was extremely disappointed when the football club I have supported my whole life turned down my offer to purchase them in favour of a £330,000,000 bid from New England Sports Ventures although, on reflection I can see that the club needed the additional £329,999,999 that their offer entailed and, as both offers were in cash, I’m at peace with the rebuttal. As for watches, well, I have 4 lovely timepieces and, at the end of the day, a watch is just a watch and tells the time and getting another one would just mean the other 4 spending more time in a drawer. So, I focussed on what opportunities music might provide me for a memorable present off my family. You can see elsewhere that I have a range of lovely acoustic instruments including 2 guitars, a couple of mandolins, 3 ukuleles and an old and decrepit banjo (which refuses to stay in tune as it has friction pegs). My 2 guitars (Naomi – a 1978 Guild D40SB) and Suki (a 2006 Jimmy Moon 0003) have very different sounds. They are made from different woods (Sitka Spruce/Mahogany and Adirondack Spruce/Indian Rosewood respectively) and are kept in different tunings (EADGBE for Naomi and DGDGBD for Suki). Different guitars, and different tunings, for different styles. But I’ve always wanted to learn to play more in DADGAD tuning and open D (DADF#AD) and it’s a real pain to have to constantly retune your guitar, as well as putting strain on the neck, tuners and strings. So, could another guitar be added to the stable? In a recent post I shared my thoughts on trust using the example of an English luthier called Dave White who built a guitar that normally sells for £2100 and happily sent it on a roadtrip around the British Isles to spend time with a number of different guitarists (including me) who would play it and review it. I loved the guitar, it had many of the qualities I like in a handbuilt instrument and, when tuned to open D , got very near to the sound I was looking for in a Celtic guitar and I was sad when I had to pass it on to the next guitarist on the trip. And I appreciated Dave’s trust in sending it to someone he didn’t know, who would be objective. However, there was no way I could afford that sort of money on another guitar again so was looking for cheaper (much cheaper) alternatives! They wouldn’t be the same as a handbuilt, personalised instrument but needs must. I was amazed, and delighted, when Dave emailed me completely out of the blue and said that, to thank me for taking part in the road trip I should get in touch with him as he was sure that “we could sort something out”. I wasn’t so convinced but I got in touch and, yesterday, tagged on to a meeting I had in High Wycombe, to cut a long story short I had the genuine pleasure of visiting de Faiote (pronounced du fweesher!) guitar HQ to meet with Dave to look at options for my 50th birthday present guitar. I know I should have taken loads of photos and stuff but I didn’t – I was too busy nurdling and talking specs with Dave – this is a really big decision for me and one which Dave helped enormously with sound, honest advice and opinion. My original intention was to go for the Lughnasa as I wanted access to the dusty end but, on trying it out, we both agreed that it wasn’t just as bass-y as I was looking for. The Samhain was close (Dave had both the Traveller and his own Cedar/Maple to play) but Dave suggested I try the Treebeard (a baritone guitar) which, capoed on the 2nd fret, gave me an idea of what a Sir Bill would sound like. we talked neck profile and nut width, strings and tunings (and Dave gave me a quick lesson in DADGAD which I also found extremely helpful). Headstock: Solid, tbc veneer front and rear of headstock. Leo Zodiac sign wooden inlay on headstock front. Soundhole/Rosette 108mm diameter soundhole. Wood rosette with black/pear/black inner and outer purflings. Soundport: Side soundport on bass side upper bout. Neck: Bolt on flamed Maple/Sycamore with adjustable truss rod and twin carbon fibre rods. Scarfe joined headstock and stacked heel with twelve frets clear of the body. Tuners: Gold Gotoh with wooden buttons. Bridge: Rio Rosewood slotted with ebony five degree taper unslotted bridge-pins. Rio Rosewood bridge plate. Fingerboard: Ebony bound with the same binding as body or ebony, black/pear/black side purfling, 20” radius, white side dot markers. 19 frets, Medium Japanese. Binding: Flamed Australian Blackwood or Curly Eucalyptus with bpb side and top/back purflings. End graft – centre strip of the same wood as the headstock veneer flanked by bindings with mitred black/pear/black side purflings. Finish: Hand rubbed pre-catalysed lacquer. Tru-oil on the neck. Strap buttons: On neck heel and in centre of end graft. Once again, it’s in different woods to my current instruments so will sound completely different. 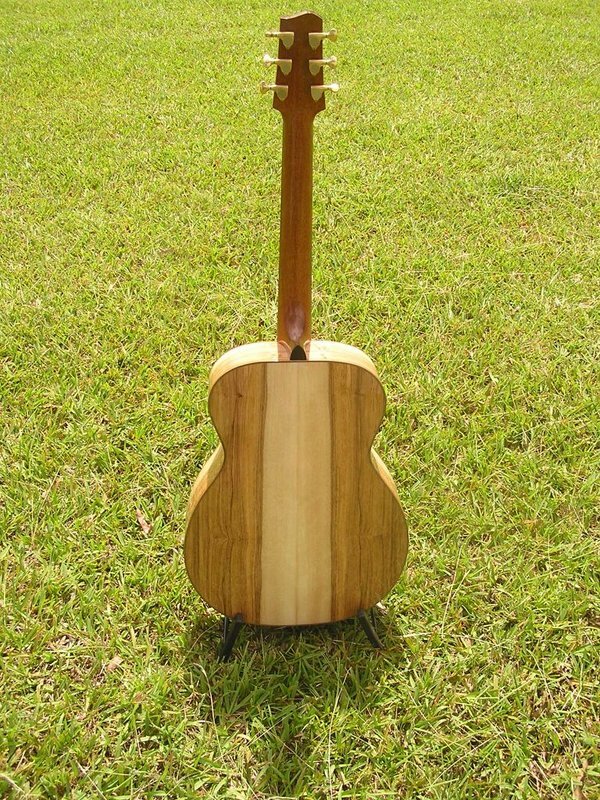 The Red Western Cedar of the soundboard will give it a warm, muddy tone which will be countered slightly by the Tasmanian Olive Wood back and sides. On completion it will be only the third guitar in the world using this combination of woods. 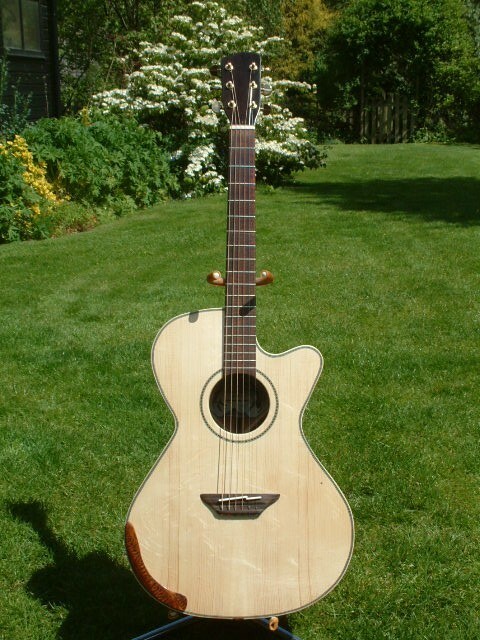 I’ve added a couple of options like multiscale fretting and a venetian cutaway which would, in the normal way of things add £350 to the base price of £2100. But when Dave said he was sure we could “sort something out” he wasn’t blowing air – he meant it and my brand new, handmade, unique and personalised guitar will be coming to me at a price that Dave, my wife and I can live with – and Mr Visa doesn’t even get a look in. Dave is also going to inlay a personalised glyph in wood on the front of the headstock – part of HIS birthday present to me! It will take Dave about 3 months in total to build the guitar (apart from anything else, the Olive Wood is still en-route from Australia!) and then it’ll need a few weeks to breathe and settle before being passed over to me in time for my birthday. Dave has said that he will chronicle the build on the De Faoite Stringed Instruments website so, if anyone wants to watch a guitar being built … that’s the place to watch. Excited? you bet I am!